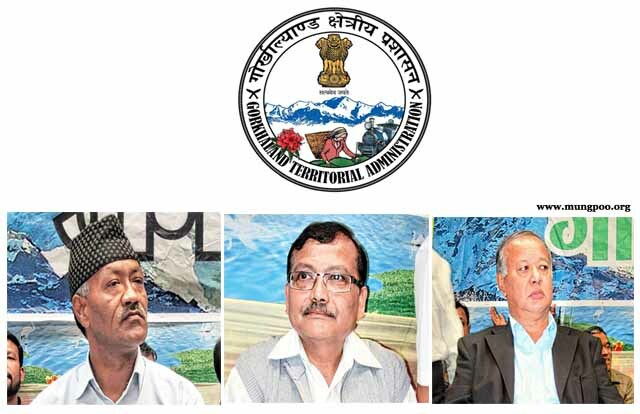 The Gorkha Janmukti Morcha today announced that its three MLAs would resign from the Assembly on September 23 to protest the state government's alleged interference in the functioning of the GTA and hill municipalities. Although the Morcha had complained in the past that the GTA was not allowed to be run independently, the trigger for today's announcement was the district administration's order to demolish the top floors of a school building being constructed by the hill body on security grounds. Soon after the resignations were announced, the district magistrate said the curb on the re-construction of the Ram Krishna Siksha Parishad Higher Secondary School was lifted. But the Morcha said it still stood by the decision on the MLA's resignation. The decision to announce the resignation of the Darjeeling, Kurseong and Kalimpong MLAs was taken at a meeting convened by the Morcha president and GTA chief executive, Bimal Gurung. Elected members of the GTA Sabha and councillors of all four hill municipalities attended the meeting at Patlasbas in Darjeeling. The civic chiefs and the councillors were also directed not to attend any meeting called by the state government on issues related to the municipalities. Addressing a news conference at the Darjeeling Press Guild around 3pm today, Roshan Giri, the general secretary of the Morcha, said: "It has been more than three years (since the GTA was formed) but the state government is showing no inclination to allow the GTA to function properly. The departments have not been fully transferred and as agreed in the GTA deal, the school service commission, college service commission, subordinate selection board and regional pension and provident fund board have not been formed." "There is dual administration in the hills now, that of the district magistrate and the GTA. The reconstruction of RKSP (Ram Krishna Siksha Parishad Higher Secondary School) was stopped. To protest this day-to-day interference by the state government on every aspect, our three MLAs will be resigning from the Assembly on September 23," said Giri. The state government has to transfer 57 subjects to the GTA, but the Morcha says not all of them have been handed over to the hill body. All the 57 subjects were clubbed together and converted into 40 departments. The hill party said although some of the departments were handed over to the GTA, the transfer was not done in a complete manner. While Gurung's grouses over the state's interference and non-transfer of the departments are not new, the announcement of the resignations was prompted by Mamata Banerjee's three-day visit to Darjeeling starting from August 24. Gurung was annoyed over Mamata' decision to form a separate development board for the Bhutias and her directives to officials to crack down on illegal high-rises in Darjeeling. Gurung believes checking illegal buildings falls under the municipality's jurisdiction. According to rules, the height of buildings in the hills have to be restricted to 11.5m. Soon after the chief minister's visit, the Darjeeling police and the subdivisional office issued notices to five buildings as doubts arose over their legalities. The stop-work notices to the five buildings, including the Rama Krishna Siksha Parishad school, infuriated the Morcha. Although Gurung had been complaining about the state government's interference and its reluctance to allow the GTA to function autonomously since 2012, the hill leader had as late as June 17 termed his meeting with Mamata at Richmond Hill, Darjeeling, as the "best ever". Yesterday, Gurung even threatened to quit the post of the GTA chief executive within 10 minutes of the district administration dismantling the school building. Binay Tamang, the assistant general secretary of the Morcha, today said: "We will write to the Centre about the interference. We will now go back to our main issue, that is Gorkhaland." Giri said the Centre had cancelled the tripartite meeting scheduled for September 15 in Delhi. "The meeting has been cancelled s the additional secretary of home affairs (centre-state relations) has been transferred. The date and venue of the next meeting have not been finalised," said Giri. The Morcha is also unhappy over the irregularity of the tripartite review meetings on the functioning of the GTA. "Meetings should be held once in three-four months but that is not happening and hence, nothing concrete is emerging out of the talks," said Darjeeling MLA, Trilok Kumar Dewan. The last review meeting was held on January 29, 2015. Within two hours of the Morcha announcing the MLAs' resignation, the state government went into a damage control mode by lifting Section 133 of CrPc imposed against the construction of the Rama Krishna Siksha Parishad school building. Anurag Srivastava, district magistrate, Darjeeling, said: "Section 133 imposed on the RKSP school is withdrawn with immediate effect in view of the prayers submitted by the school authorities and the inconvenience caused to school children." Classes for the 1,200 students of the school are currently being held in makeshift structures on the play ground of Darjeeling Government High School. On August 26, Darjeeling police had sent a notice to the school authorities to demolish the top floors of the two blocks of the school on security grounds. The notice read: "Two of the buildings are adjacent to the Mall Road opposite to the Raj Bhawan complex. The height of these buildings is above Mall Road and seriously compromise the security of the Raj Bhawan." "Keeping the sensitive nature of the government buildings, including Raj Bhawan, you are requested to immediately take up the matter with the appropriate authorities to ensure demolition of the top floors of the building near the Mall Road," the notice further states. Section 133 of the CrPC empowers a magistrate to first stop construction if a structure poses threat to human lives and then dismantle it if the need arises. The notices were sent for alleged violation of the 11.5m height restriction and deviation from the building plan sanctioned by the Darjeeling municipality, and dangerous construction. Today, Srivastava said: "The school authorities have been advised to take appropriate measures to ensure that the structure is safe in all regards and there will be no threat to safety of the building in case of a natural calamity. They have also been advised to ensure that there is no security threat to Raj Bhavan." Told about the development, Giri said: "We have always been maintaining that the school did not pose any security threat. With regard to our announcement, it stands." The Centre has in principle agreed to set up a Sainik School in the GTA area. The decision was conveyed by defence minister Manohar Parrikar in a letter to the Darjeeling MP, S.S. Ahluwalia.